Was it Geography (Optional) friendly? How difficult was the Geography section in Mains 2013? Utility of Hindu in GS (Mains) Geography portion? [Physical 2] Why Hot Deserts in N. Hemisphere? December 2013, UPSC conducted Civil Services Mains exam. Jan 2013: I published answerkey for Indian History Answerkey and Culture Answerkey for General studies Paper I (GS1). Then I drifted away to economy related articles given the IBPS and IIM interviews. Energy and Industrial location (4Qs) done click me. total 70 out of 250 marks 28% only 15 marks current related. only 15 marks world geography. Contrary to expectations, neither World geography NOR environment-biodiversity dominated the paper. Infact World geography= barely 15 marks. Nothing from flora fauna or climate change (Except heat island). OR may be because examiner thought “5 mark =100 words” rule alone was a sufficient shocker so even easy question should become BackbreakingTM, therefore he saved all the tough questions for next mains hahaha. Overall 24 marks. overall 125 marks (mostly environment related) 70 marks. temperature inversion 5 1995, 2010.
cotton textile mill 5 1979, 1982, 1985, 1996, 1999 and 2000.
total 25/70 =36% of Geography. (and 10% of entire GS1). BUT if you look at the nature of question, most of them are not falling from sky- where only Geography optional candidate can solve it and other people cannot. ^the purpose of this discussion: Coaching walla usually try to brainwash new players that “you should only take Geography optional because __ marks worth GS-question came from geography only.” Same sales-pitch goes in Public Administration, sociology, political science, even anthropology. Please don’t pick optional subjects on the sole criteria of “how much does it help in GS?” Every optional has its own headache, called “scaling system”. For five marker, you can recall at least 3 good points, & write it within given time limit. For ten maker, you can recall at least 5-6 good points, & write it within given time limit. Shale gas 10 easy only IF you followed Hindu diligently. Deserts 10 tough At least for non-geography students. hard to recollect that many points. Cyclone Naming 5 tough had to dig official website and still hard to memorize. Heat islands 5 tough Verbatim given in Majid Hussain, Fundamentals of Physical Geography 4th ed. but most non-geography student don’t use it. total 70 40 marks easy; 30 marks medium to tough. Spectrum, Geography 50 Highly useful because it covers all three parts: Physical, world and geography. Surender Singh, Geography (TMH) 41 Same as above. Although this is one type of “Guide” book for Geography optional (prelims, during pre-CSAT era).So I’m not surprised by its performance. Same for Krishna Reddy’s performance in History/culture. Savinder Singh, Physical Geography 22 Since he only deals with physical geography so appreciable performance. Almost parallel with Majid’s Physical. Majid shines over because verbatim answer on heat island theory was given only in Majid book and not in Savinder Singh, Physical Geography. GS Manual 18 Same as above. Majid Hussain, Geography of India 5th Edition 14 For Indian Geography, DR D.R. Khullar, India A Comprehensive Geography is better choice from now onwards. MAX. possible 55(T)+15(C)=70 (T)=theory, (C)=Current. As such there is no single book where everything is given slim and trim without bogging down the reader with “Exhautive” coverage from geography optional. Spectrum or Surender (TMH) seem more beneficial (Atleast statistically) because they were written as guide books for geography optionals. Same situation was happening with Krishna Reddy’s book in Indian History/Culture answerkey, but there I could find thinner and cheaper jugaad (=TN state books, ). Unfortunatly, same case not happening here. Approach #2: selective reading from three different books: DR Khullar for India; Majid for Physical; Goh Che’s Human & Economy Geography (for world part). Although Goh Cheng’s Human geo book would be an overkill given the nature of world geo. related questions asked. Majid’s World geograhy=bad cost : benefit. only physical Majid Hussain, Fundamentals of Physical Geography 4th ed. only World Goh Cheng’s Human geography etc but cost : benefit not that great. For “Indian” geography only- DR D.R. Khullar, India A Comprehensive Geography better. for “overall” geography, Spectrum, Geography’s own “Geography” book better. Way more expensive than standard reference books. Besides usually its cut-paste-bullet version of parapgrahs given in above books. Only one question: Shale Gas why not in high policy agenda? 10 marks. Answer verbatim available in Hindu article. (GS1) Syllabus topic: Salient features of world’s physical geography. Continental Drift theory has been asked in previous Geography optional papers of 1980, 1996, 2000, 2007. Although answer is not “unsolvable” because topic is given entirely in Class11 NCERT. TMH, Geography section page 50. First, Let’s understand the topic, then we prepare answer. Question demands two answers: 1) what is the theory? 2) What are the evidences? Geographers in the early 18th century were puzzled about the location of lands and water on earth. Why are they in the specific position where they’re right now? They came up with many theories, but none plausible. Finally, Alfred Wegner formulated a theory known as Continental Drift Theory. Positions of the continents are not fixed permanently. The pieces of landmass have been floating on Earth’s upper-most layer. Once they were part of supercontinent “Pangaea”, surrounded by a mega ocean Panthalassa. But in carboniferous period, it was broken into two parts: Laurasia in north and Gondwana land in south, with a shallow sea of Tethys in-between them . They got further broken and drifted apart. Therefore, Wagener believed SIAL layer used to float over SIMA layer. With this crude information of Earth’s composition, he was unable to explain what force caused such displacement of the continents. So, He claimed tidal forces and centrifugal force were responsible for westward and equator wards movement of the present continents! Still, his evidences for the possible drifting of the continents were a landmark discovery. Noticeable in both sides of Atlantic Ocean. Eastern coastline of South American continent and Western coastline of Africa matches like jig-saw puzzle. It seems that they are broken from a united piece. But that could also be a co-incidence! Mountain system and rocks are also similar on the opposite sides of the continents. Eg. Coal from Appalachian (USA) and coal from Kjolen mountains (Norway) have same properties & composition. Rocks of west coast of Brazil vs. East coast of Africa. A fern like plant-Glosspteris found in India, south America, South Africa, South Australia and Antarctica. A mammal like reptile from Lystrosaurus genus also found in S.Africa, S. America, Asia and Antarctica. This creature was strictly a land dweller- there is no way it could have swam so far. Same for Lemur fossils found in India, Madagascar and Africa. Tilitate is a sedimentary rock formed out of glacial deposits. The deposits of this rock found in India, and have counter parts in Africa, Antarctica and Australia. Suggest these continents shared similar histories. Pangea=> laurasia + Gondwana. Hard to recall which period). 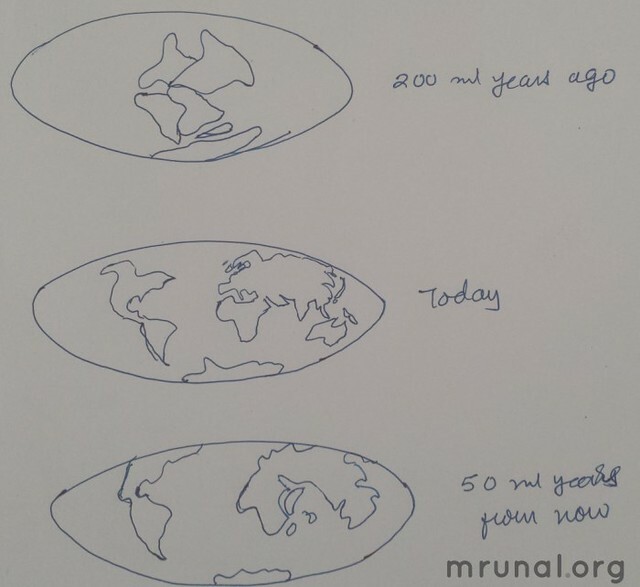 + if possible, draw a sketch- demonstrate laurasia, Gondwana, Tethys into it, to save word limit. Tidal force and centrifugal force caused the movement of land. +Diagram for additional brownie points. Alfred Wegner stated that at one time, all continents were part of a super landmass called “Panagea”, surrounded by a mega ocean. Over the time, this landmass was broken into smaller continents that drifted away from each other, under the effect of tidal and centrifugal forces. Eastern coastline of South America and Western coastline of Africa fits like jig-saw puzzle. Mineral composition on the opposite sides of the Atlantic, is identical. e.g. Gold in Ghana vs Brazil, Coal in US vs Norway. Similar Fossils found in India, South America, South Africa and Antarctica. In other books viz. 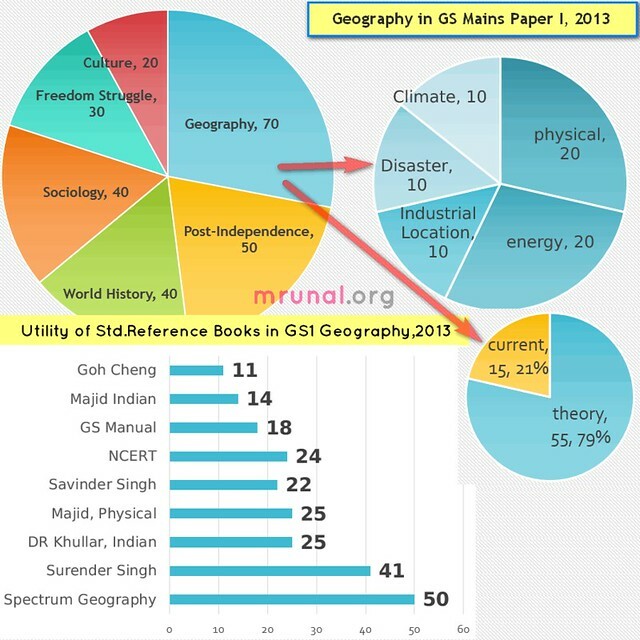 Spectrum, Geography, Surender Singh, Geography (TMH), Savinder Singh, Physical Geography the points are given, albeit scattered in monsoon, ocean current chapters. We all know that hot deserts are created due to lack of enough rainfall in the region. However, in absence of mountains, moisture laden winds can penetrate way inside the land and rain until it contains moisture. Where mountain range located parallel to coastal areas and longitudinal to route of moisture winds. Rain associated with passage of cyclone or depression. Generally at the Intertropical convergence zone and polar front. moist air rises, cools down adiabatically=> heavy rainfall. Ok now let’s check which rainfall can occur in 20-30N? type Can it occur in 20-30N? Nope, because precondition is high humidity. 20-30N region comes under sub-tropical high pressure zone => cyclones cannot occur. And since cyclones cannot occur= cyclonic rain cannot occur. Besides, this will create anti-cyclonic condition (high pressure) on ground. This prevents rising of air and formation of clouds. The moisture laden winds from ocean follow the path of trade winds, from east -> west. So moisture carried by winds results into rainfall in eastern side of the continents, they become dry by the time they reach the western side. When air becomes saturated with the water vapour at given temperature and pressure, it results into cloud formation. Lack of Cyclonic Rainfall: The 20-30 N region comes under Sub Tropical High Pressure(STHP) zone, so they experience anti-cyclonic effects on ground. This deters rising of air, cloud formation and cyclonic rains. Lack of Orographic rainfall: The eastern region of 20-30N receive rain due to moisture laden trade winds, but by the time they reach western side, they become dry. Hence scanty rain in western region. Lack of Convectional rainfall: precondition is moisture laden warm air. But due to Cold currents, the air near coastal areas is cool and dry. This prevents formation of convectional rainfall. And thus lead to desertification effect on western coast of continents. For example: Californian cold current vs. Mohave desert; Canaries cold current vs. Sahara desert and Arabian desert. Low level of Relative humidity: When air becomes saturated with the water vapour at given temperature and pressure, it results into cloud formation. But Relative humidity is very low in the desert, every droplets of moisture is evaporated before the air becomes saturated with water. Hence lack of cloud formation. Majid Hussain, Geography of India 5th Edition Chap 3: Drainage –The peninsular river systems – table on difference between Peninsular and Extra-peninsular rivers. Savinder Singh, Physical Geography– only condition of delta formation are given in page 265 else nothing specific on Western Ghat rivers. 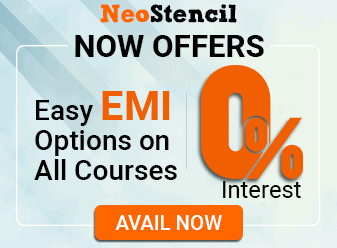 NCERT Class 9 chapter 3. At the source of river. River cut across the valley, erode it vertically. River channel becomes shallow and wide. River contains lower volume of water ->less fluvial force to carry even fine sediments, large amount along the mouth of the river. => Delta. The landform created by the sediments deposited by the river at its mouth is called Delta. What about rivers of Western Ghat? Rivers of Western Ghats flow through peninsular plateau. Peninsular plateau has hard rock surface and lacks alluvial material. So rivers do not carry large amount of sediments=> cannot deposit it @mouth of river to form deltas. They receive less amount of rainfall compared to Himalayan Rivers. they are small streams. They flow rapidly from steep slopes and merged into Arabian Sea covering very short distance. They can form estuaries and not deltas. flow through relatively shallow and eroded valley = less fluvial force. Delta is a landform created by sediments of large rivers at its mouth. Rivers of Western Ghats flow through peninsular plateau, which has hard rock surface and lacks alluvial material. So rivers don’t carry large amount of sediments to be deposited at their mouths. They receive less amount of rainfall compared to Himalayan Rivers, some of them non-perennial in nature. East flowing rivers flow through relatively shallow and eroded valley, hence unable to produce large amount of sediments. West flowing rivers of Western Ghats are small streams, flow rapidly from steep slopes and merged into Arabian Sea covering very short distance. They can form estuaries and not deltas. Remaining answerkeys in next two articles. sir,is it true that upsc is going to reduce no of attempt and age limit from 2015. Sir, how no. of words are counted f an answer ?? Thanks for the answer keys, however I feel your answer to the desert question is not accurate. The simple reason why deserts are 20-30 degree north is because water evaporated at equator rises and reaches a Max level then it proceeds further in all directions N,S,W,E. The air cools down and and rain falls by the time air reaches 20-30 degree north air contains no moisture so no rain fall. Further this area lies in easterly trade winds where winds flows NE to SW, if we look look at all deserts here no ocean can be found in North east of them so trade winds contain no moisture for them further these easterly trade winds are the reason for deserts to be in west of the continent because by the time tree winds reaches western cost moisture of trade wind is already gone. This holds true not only to 20-30degree north but south also. If we go by logics of cold ocean current then western coast of Europe, north america and eastern cost of norther n Asia should also be a desert. thank u very much for ur great work to help students. sir, mains exam of CSE is comming, so plz explain some Geography questions-answers which r more difficult asked in previous GS paper. this is a amazing for the optional geography student but gs paper also for our future as well as how to improved ourselve for mains exam of civil service.